Once upon a time there was a merchant who had three daughters. The two eldest daughters were very haughty, and were only concerned with their dresses and their jeweler. They never ceased to insult their little sister, who was gentle and kind. As she was also very beautiful, the youngest sister was named beauty. She prepared the meals and did the housework while her sisters enjoyed themselves. One day the merchant received a letter informing him that he had to go to town on business. The eldest daughters were full of expectations and asked their father to bring them new clothes when he returned. I promise I will, he told them. And you Beauty don't you want anything?'' Thank you father she answered, but I need nothing However should you find a rose, I would be delighted to smell its delicate perfume. Their father left for the town, but business being bad he decided to return home early. On the way home through the forest, he suddenly saw a bright light shining. Moving closer, he discovered a magnificent palace. As its door was open, he entered and called out. Is anyone there? But the palace was empty. He walked into the grounds and saw beautiful rosebushes growing beside the garden paths. Then he remembered Beauty's request and picked a rose for her. At that very moment he heard a deafening noise. A huge beast appeared and cried out, You have stolen a rose of mine, one of my most precious belongings, For that you must perish. He paused. Unless you have a daughter who would be willing to die for you. If you have, go and fetch her and your life will be spared. When he arrived home, the merchant told his daughters of the terrible thing that had happened. Beauty said to him, Father, let me go in your place. The father cried out in protest but Beauty would not listen to him. The following day. she mounted her horse, and rode straight to the Beast's palace. Once again, the palace seemed deserted. She entered ad looked around. Inside there was a library and some magnificent furniture. At midday, she found a sumptuous meal laid out on the table and beautiful music delighted her throughout the meal. As dusk approached, she wondered when the Beast would finally appear. It was at nine o'clock when a tremendous noise made her tremble. The Beast was coming would it bother you if I watched you eat your evening meal? asked the Beast. Master answered Beauty you may do as you please. I am at your service, said the Beast, who added, tell me truthfully do you find me ugly? You are ugly but you are good-natured. You have treated me like a real princess. And she found that she was no longer afraid of him. Will you marry me? the Beast asked her. No she answered at once surprised by the question. At that the Beast left, greatly saddened by her reply. Days passed. The most exquisite dishes were prepared for Beauty, and every morning she found magnificent new dresses, embroidered with gold. Each evening, the Beast asked her gently, Will you marry me? and every time he received the same answer, which file him with sorrow. One evening the Beast asked her, What else can I do to make you happy? All I wish is to see my poor father again, she replied. In that case, promise me that you will return in eight days time. Take this ring. As soon as you place it beside your bed, you will be transported back here. Then the Beast clicked his fingers, and Beauty suddenly found herself back at home. Her father held her in his arms for a long time. But her sister were very displeased to see her since she must go back in eight day's time, let's make sure that she stays here longer, they said to each other. Then the Beast will Seek revenge, and surely he will kill her. On the eight day, they pretended to mourn her departure. Beauty had begun to miss the beast but felt sorry for her sisters and said, I will stay just a little longer. But then beauty dreamed that the Beast had died of sorrow. Very worried, she laid the ring beside her bed and instantly found herself back in the palace. She searched for the Beast for a long time before finally finding him in the garden. Lying beside a stream, he looked as though he were dead. She splashed some water on his face, and the Beast opened his eyes. I thought you had forgotten me, and I felt I would die, said the Beast. Do not die. I want to marry you! cried Beauty. 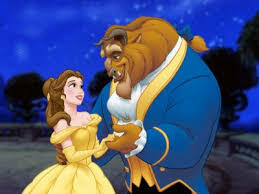 At these words, Beauty was astonished to find that instead of the Beast, a handsome prince was gazing lovingly at her. What has happened to the Beast? she asked hi. He stands before you. the prince answered gently. An evil fairy cast a spell on me and you have broken the curse, now that you have agreed to marry me. And so Beauty and the Beast were married in a marvelous ceremony and lived a long happy life together.